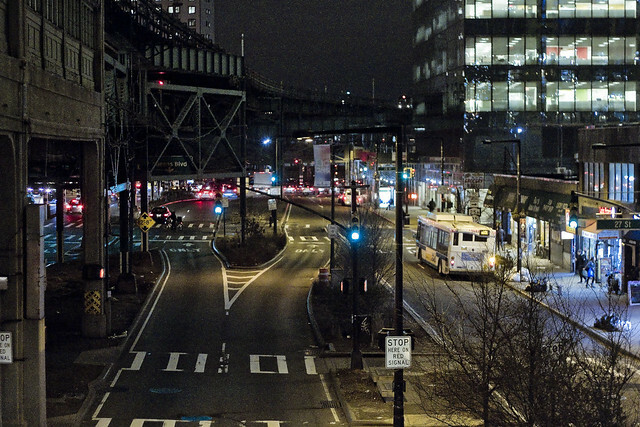 There may be vampires there, but how can you avoid Queens Plaza? Two of the proposals which Access Queens, a transit advocacy group which I’ve been working with for the last couple of years, has offered to the MTA to ameliorate the chaos which the forthcoming L train shutdown will bring to Queens when the masses of infinite Brooklyn are steered towards Long Island City are: a) extend the G line one stop from Court Square to the IND Queens Plaza station and b) allow a free “walking transfer” between the IRT Queensboro Plaza station upstairs (N, W, 7) to the IND station below (E, R, M). In the case of the G extension, it would simply undo one stop’s worth of the cutbacks in service which the MTA created back in 2008 and allow Queensicans the opportunity to not have to use the particularly narrow and crowded platforms of the former 23rd Ely stop on the IND tracks at Court Square. By MTA’s own numbers, which must always be taken with a grain of salt, the 7 line is at capacity by the time it rolls out of Woodside. The E and M lines are fairly close to the number of passengers one can expect to fit on board, and the R line is extremely crowded as well. 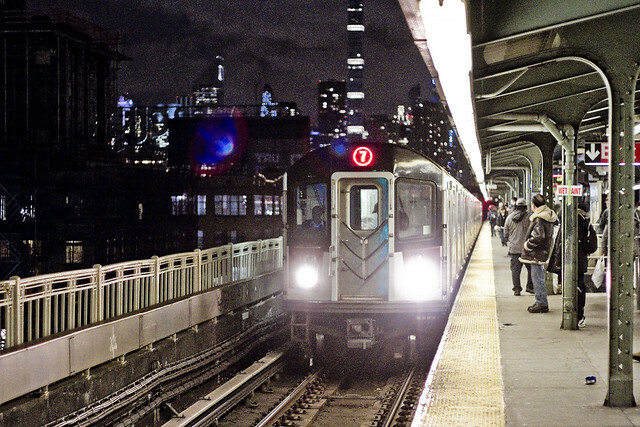 When the L train shuts down for repairs of the Canarsie tunnel, MTA’s announced intentions are to add another car to the G and pulse the L’s cross river ridership into Court Square, where they’re meant to transfer to – you guessed it, the 7, E, or M lines. 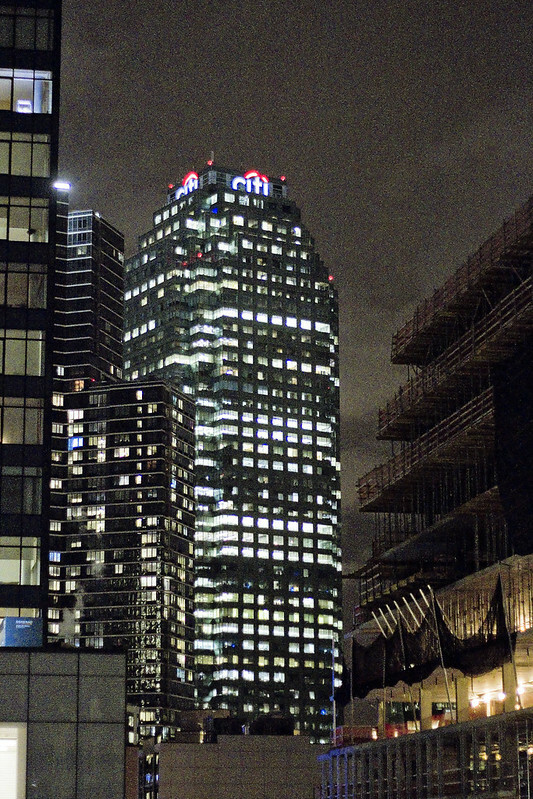 Court Square is a “Frankenstein” station, cobbled together from the IRT above and the IND below to satisfy the needs of real estate interests in LIC. The escalators and elevators in the station seldom operate reliably, and there’s a chaotic scene at work there during the busy times as masses of people move through corridors connecting the lines that can be as long as two city blocks. Were the option to transfer at a station purpose built for massive crowds of people moving through it, aka the IND tracks at Queens Plaza with their wide platforms, the situation would be somewhat manageable. At Court Square, it’s the proverbial ten pound load being crammed into an already full five pound box. When I first moved to Astoria about fifteen years ago, I was startled to discover that there was no mechanism in place to facilitate a transfer between the upstairs IRT and downstairs IND platforms. Given that in Manhattan the N and W lines share trackage with the R… well, I guess that logic often has little to do with the way that MTA operates. One is continually surprised that MTA (the A is for adventure, you know) still operates the NYCTA system as if it were the age of the dual contracts, and that after a half decade of absolute control over both the A and B divisions of the Subway they maintain the distinction. One would imagine, if private capital was involved, that after fifty years there would be greater interoperability at least in terms of fare control – let alone maintaining two seperate fleets of rolling stock to accommodate a few inches of variance in platform depth.